Now that the transition from email- to chat-communication is already done in the consumer market, more and more companies are looking for a safe messenger and chat solution. The market has to offer varieties of communication tools, group-chat-software, and messenger for companies. However, the market for chat apps and messenger is not transparent at all and there are tremendous differences between providers and the different product categories. A lot of tools are not up-to-date in terms of technology, there is a lack of attractive mobile application or the apps are just too complex for users to use because of the many features. That is why WhatsApp is used for communication in a lot of companies, although it is not wished because of privacy reasons or it is just being tolerated because there is a lack of good alternatives. tchop is fulfilling the strict European privacy regulations. Your data is not leaving European ground at any time. All messages are encrypted end-to-end and cannot be read along. We do not track any unnecessary activities or things, we do not sell them or pass them on to the third party. WhatsApp, on the other hand, has just announced that it will soften the end-to-end encryption to get into commercialization. Therefore messages will be evaluated and read along for targeted advertising. A ”no-go” for companies. With WhatsApp, every user can create, close or administrate groups. Often these develops a sheer mass of chat groups, sometimes different groups for the same topic. A communicative chaos, which is not efficient and annoying for professional work. With tchop the company has the control to decide, who is chatting with whom in which groups. Groups can be public or private. A central management, that ensures, that the internal communication is transparent, comprehensible and especially in the interest of the company. Neither in WhatsApp nor in other private chat solutions the company is represented or has any type of visual branding. tchop offers a safe chat in an own app in the Look&Feel of the company. Every push note, also outside the app, is placing the brand in the message center or on the lock screen of the user’s mobile phone. Perfect, mobile employer branding. Plain chat apps are practical for communication between users. But they are not very suitable to share structured and lasting information and knowledge. Important messages go under and are hard to find if they are needed. Content can not be edited and put into context. In the own app, tchop is offering the possibility to present relevant content attractive in the right way for your target group. Users do not have to switch between chat and news app – they find everything in one place. As a consumer-app WhatsApp can be downloaded from the App Store. This is useful and easy, but it is not wished all the time. Often as a company, you do not want your app to be publicly accessible, most of the time you want to distribute it to all or specific employees. The own tchop app can be distributed over an own mobile device management as a B2B app. That gives you the benefit to control who downloads and uses the app. Like with emails there are documentation requirements for communication tools. This means that also older messages have to be saved (at least) for a certain time. WhatsApp is giving messages out only if there is a judicial order otherwise it is in the “Black Box”. With tchop, on the other hand, the company has the possibility to save their whole history of chats on their own safe server, so that the company can have access to it whenever necessary. No question: especially WhatsApp as a leading chat solution is a great application for consumers, probably one of the most successful of all time. The technical solution is still one of the best. Nevertheless, for a company, there are other requirements for privacy, data protection, control, and transparency. 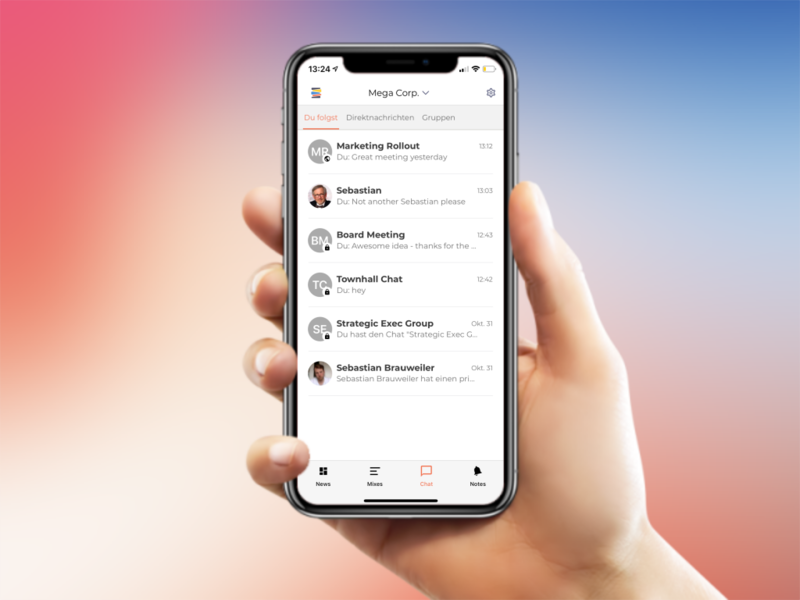 tchop gives you the possibility to connect the advantages of a real-time, native chat on the highest security level with an own brand app in your own Look & Feel to fulfill the needs of both – user and company. Next Post How to use native sharing smartly..